Looking for a great way to keep kids entertained during a roadtrip with a Windows phone or tablet? If so, you should definitely check out the new Dragon Adventure World Explorer augmented reality game from DreamWorks. Dragon Adventure World Explorer uses real-world data to create a unique in-game environment based on the popular How To Train Your Dragon 2 movie. The game interfaces with HERE Maps to populate the fictional isle of Berk with the buildings, bodies of water and roads that surround you in the real world. Local traffic conditions, real-world weather, time of day and even Foursquare popularity data all factor in to each gaming session, turning each new roadtrip into a new game experience. And if your kids enter in your real-world destination into the game, each session will automatically wind down as you complete your trip, making it easy to get kids’ heads back in the real world. Of course, if you’re not on the go, there’s still fun to be had. The game’s Explore mode lets you kids take a virtual trip to 16 major real-world cities (e.g., Berlin, Nairobi), completing dragon rescue missions in each. 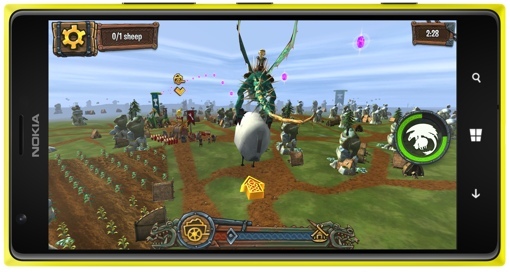 DreamWorks Dragon Adventure World Explorer is currently available for free without in-app purchases on both the Windows Phone Store and the Windows Store.